The new FX3UC PLC complements the popular FX3U high-end compact PLC and is the ideal choice for applications where there is not much space for the controller hardware. Its technical specifications are virtually identical. The smallest base unit with 8 digital inputs and 8 transistor outputs takes up just 27%of the space required for a comparable FX3U unit – and yet the FX3UC incorporates all the features of the FX3U. The new MELSEC FX3UC CPU brings greater flexibility and more performance to applications which do not have space for traditional style PLC’s. 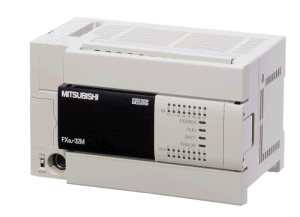 Like all other members of the FX family, each FX3UC PLC consists of a fully-integrated base unit that contains all the necessary PLC components, from the CPU to memory and the I/O controller. The FX3UC base units all have a 24V DC power supply and are available in versions with 16, 32, 64 or 96 I/Os. They can be expanded up to a maximum configuration of 384 I/Os by adding expansion modules and networked I/O points. The MELSEC FX3UC controllers are particularly well suited for applications in areas, where installation space is very limited or decentralization is needed.